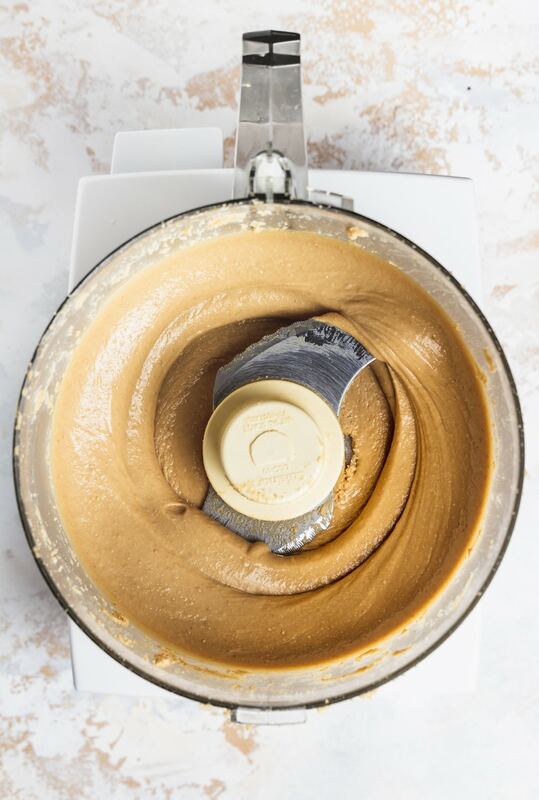 Learn how to make your own cashew butter with a twist! 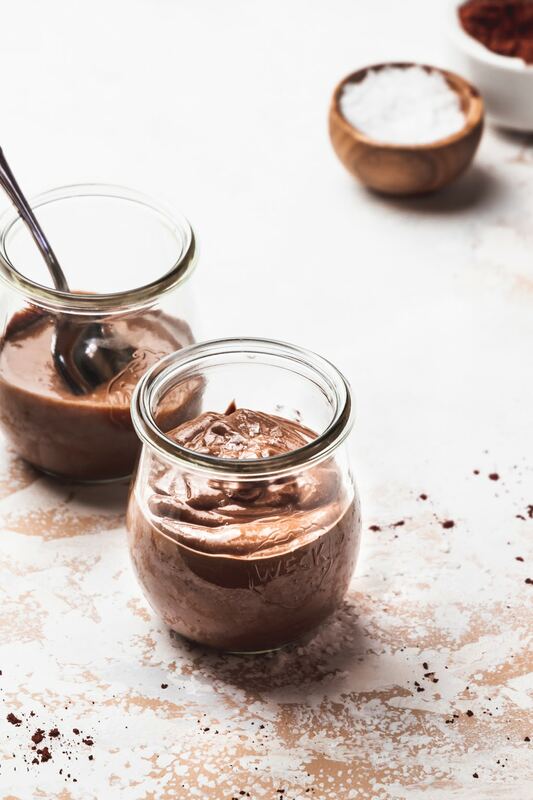 Rich, melted chocolate makes this homemade nut butter recipe truly amazing. Let’s talk about kitchen fails, friends. I have had some doozies over the years. 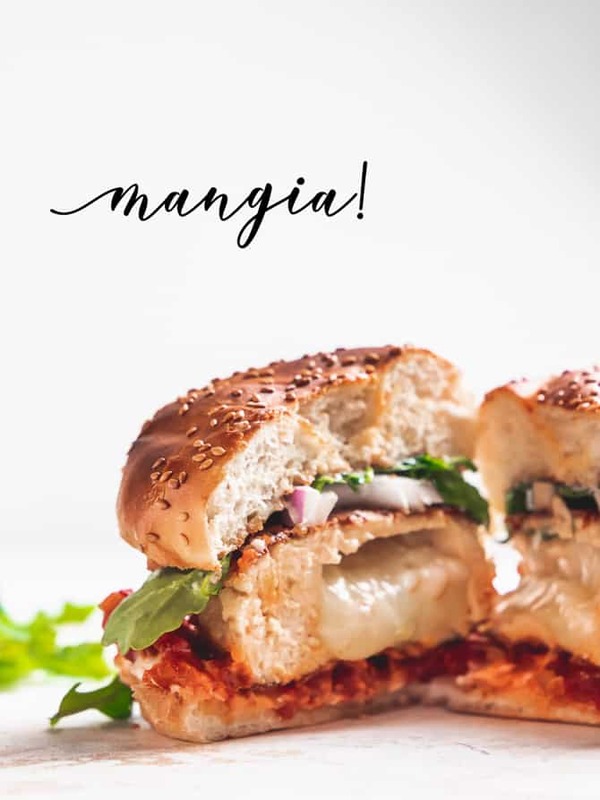 Undercooked chicken, overcooked fish, soggy bottoms, tough crusts, dropped pizzas (a truly sad memory), and all sorts of other tiny tragedies have littered my path from Jo as human to Jo as cook. You would think that all those learning opportunities (as I’m choosing to refer to them), AND the fact that I run a freaking FOOD BLOG, would naturally incline me towards an accident free kitchen all the G-D time, right? Hm, well, not….really. Honestly I think blogging is really just a way to make my mistakes in a more public forum. Excellent. 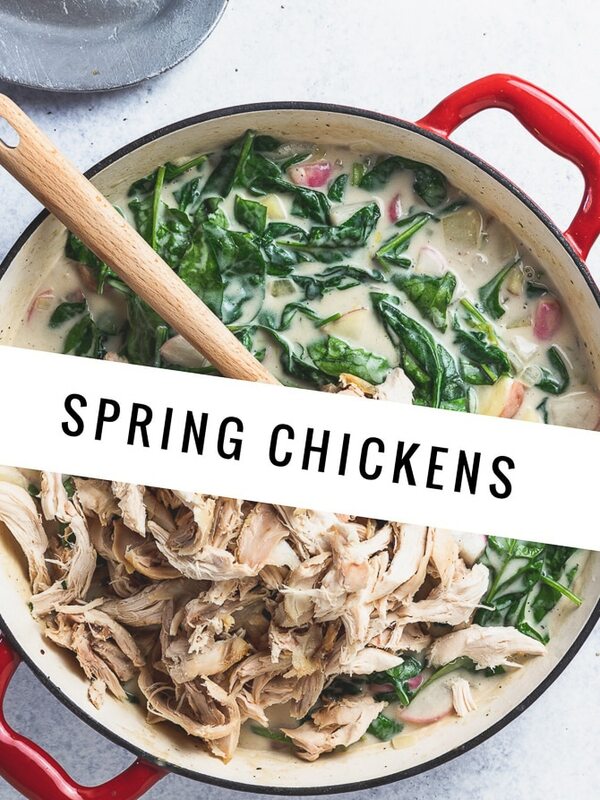 But all those opportunities to learn mean that hopefully I come out the other side with a bit of knowledge, and bonus for you – a foolproof and awesomely delicious recipe to share. But before we jump right into the recipe, let’s talk about where I went wrong first. Firstly, don’t underestimate the ability of the internet to LIE TO YOU. I did look at a number of recipes (and tried at least one) that all said to just pop the ingredients in a blender and go to town! 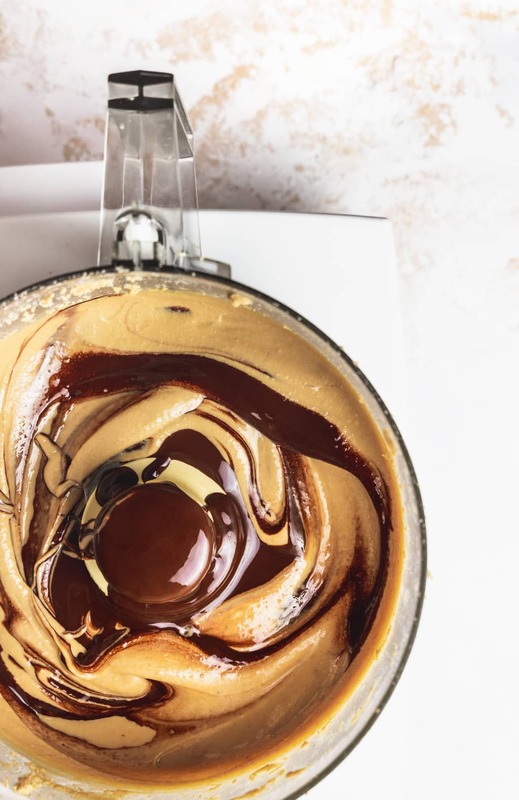 From what I’ve learned, in some cases this would totally work, but the course of your journey will change depending on the ingredients you use to make your cashew butter (or any nut butter for that matter). 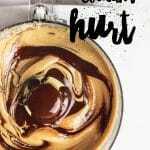 So takeaway here – because making your own cashew butter IS a simple process most recipes will be similar, but this does not mean they are created equal. Now, how do you tell a lemon from a gem then (odd comparison, I know). Well obviously there is no hard and fast test to determine a great recipe from a dirty, dirty lie. But there are a few things to look out for. Does the recipe include some helpful tips, notes, or things to look out for? Even if it’s simple and fast and OH MY GOD THE EASIEST “insert dish here” YOU’VE EVER MADE, it still warrants some explanation. In fact I’d say that the simpler the recipe the more you should spell it out. There’s nowhere to really hide with only a handful of ingredients, ya know? So what trouble did I run into exactly on my journey to blissfully creamy, chocolate cashew butter? Separation. No, not the emotional sort – although it seems very funny to think of me endlessly sobbing at the thought of being torn away from a jar of this stuff. But the kind of separation where nuts get buzzed into a frenzy and then nature says “nope, sorry” and you suddenly have an oil slick on top of weird crumbly pieces of pulverized mush. 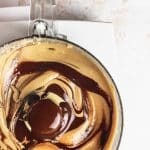 How do I keep nut butter from separating in the first place? Short answer – don’t add water (or water based liquids). When you’re making straight up nut butter with no bells or whistles this shouldn’t be an issue. But let’s say you want to throw in some honey, or maple syrup, or in my case melted chocolate. Then you need to heed my warning and not just chuck it all in your blender and hit go, because the water will cause the nuts to seize, and then you will be a sad, cashew butterless, human. Instead, process the nuts solo and when you’re firmly in butter territory then add your sweetener of choice and process it just to combine. Speaking of nuts (ha) should they be roasted or raw? Technically this is a roasted cashew butter recipe, and that is because I was lazy and felt like buying pre-roasted nuts. 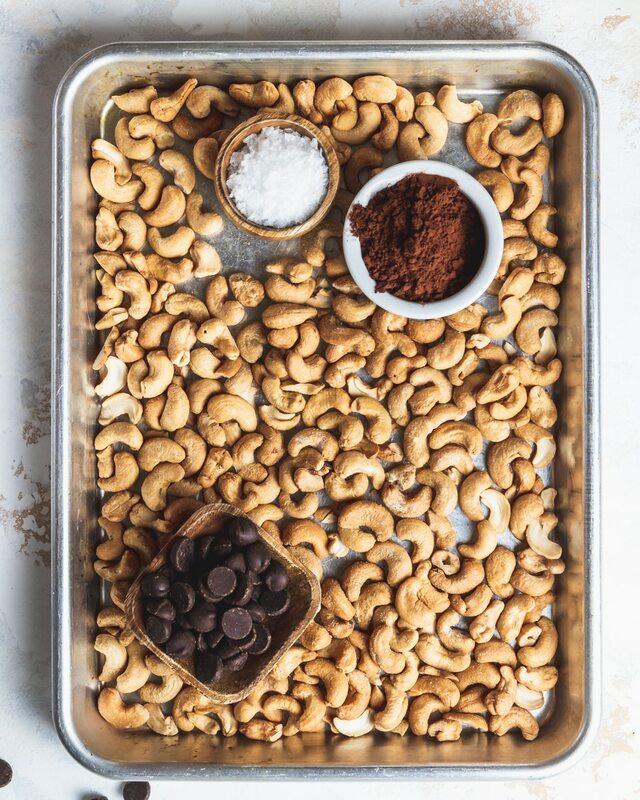 But if you have raw cashews on hand, just pop them on a sheet tray and roast them for about 15 minutes in a 350 degree oven, until they turn golden brown and start to smell amazing. I personally wouldn’t skip this step, because roasting any nut brings out their natural flavors, which will make your cashew butter taste that much more…nutty. Assuming your have a high powered blender, you can use either. But I’m going to make the case for the food processor for one, significant reason – getting sticky stuff out of a tall blender jar is hard and messy and I hate it. Food processors have a nice, open bowl with a removable blade which means extracting your rich, creamy, chocolate cashew butter out of the damn thing is just way easier. That said, if a blender is all you’ve got, it’ll totally do the job. And now that you have your jar of creamy, nutty, chocolately, magic, what will you do with it? What to eat with cashew butter? Uh duh, like everything. This stuff is good on toast, fruit, stirred into oatmeal, layered into a yogurt parfait, drizzled onto ice cream, or just eaten by the spoonful – no one’s watching, just do it. You can also treat it like any other nut butter and include it in your favorite recipes (like these ridiculously fudgy brownies), although the texture is a little looser than your standard store bought variety, so keep that in mind. Alright, I feel satisfied that we’ve turned my past kitchen failure into a future kitchen win for you. Please make this, friends and eat it on all the things. If you do, feel free to leave a delightful comment below and give the recipe a rating while you’re at it. I’d say I’d love you even more, but I doubt that’s even possible. Happy Friday! A little chocolate never hurts right? 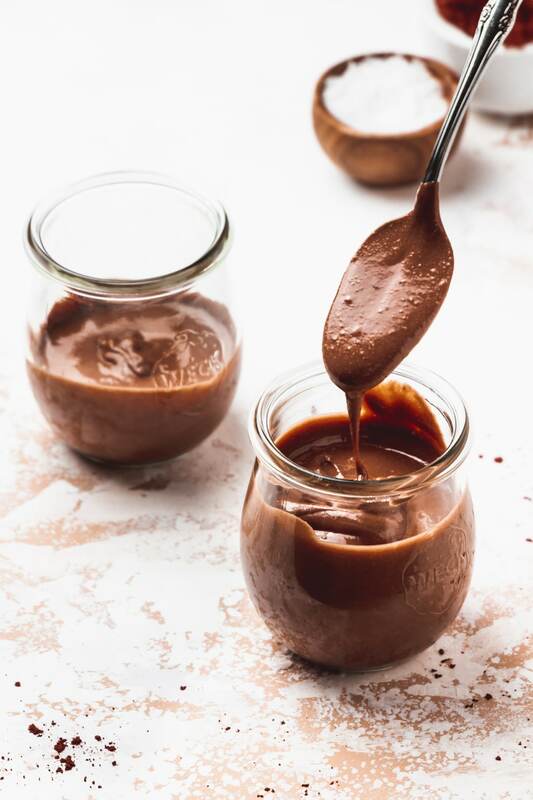 Learn how to make homemade cashew butter with this easy, delicious, slightly sweet, chocolate cashew butter recipe! Place cashews in the bowl of a food processor and process for a total of 7 to 8 minutes. During this time the nuts will transform from dry and sandy to sticky and crumbly, and will eventually clump together into a large ball. Just keep processing until the whole thing smooths out. It will take about 2-3 minutes to get to this stage. Stop the machine and scrape down the sides. You’ll notice that the cashew butter is now thick and tacky. Keep processing for a few more minutes, until the the cashew butter becomes noticeably creamy and looser in consistency. 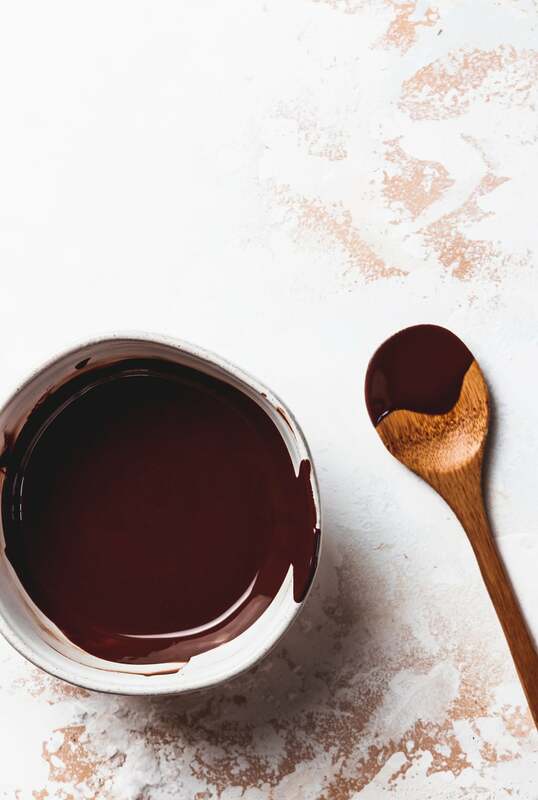 Meanwhile, microwave the chocolate and coconut oil together until melted (about 45 seconds). 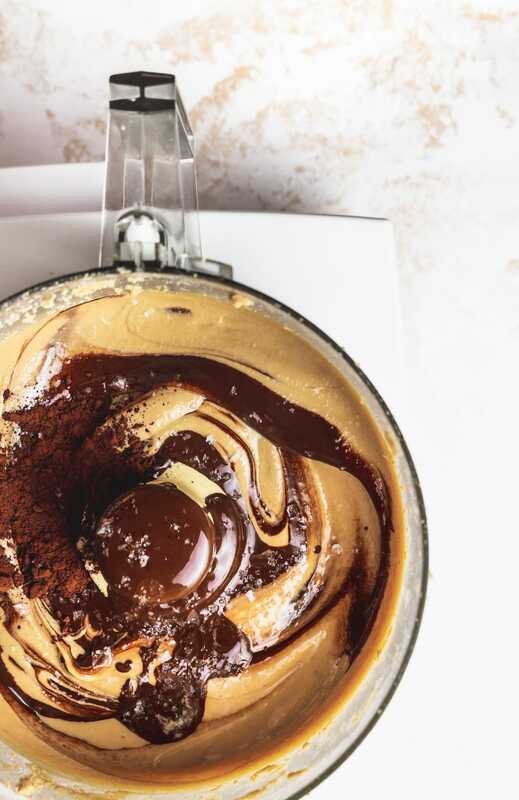 Once cashew butter has reached your desired consistency, add in the chocolate and cocoa powder. Process just until it’s mixed in – a couple of pulses should do it. If you prefer you can also stir it in by hand. Sprinkle with sea salt and serve. Store in an airtight container in the fridge. If you use raw cashews, roast them first in a 350 degree oven for 15 minutes, until golden brown. Also double the salt in the recipe, or adjust to taste. Don’t give up – it will seem like it’s never going to get there, but it will – patience grasshopper. DON’T add liquid of any kind until the very end. Good heavens I literally want to eat the entire jar with a spoon. Looks amazingly creamy and delicious! Thanks Haylie! I was going to just make plain cashew butter, but then I was like…uh duh. Chocolate. This looks absolutely incredible. Definitely need to make a batch of this! Thanks Jim! Chocolate is always a winner. I know right? I wish I could have kept the whole thing swirled, like grown up goober or something.